Space Force Turn Around Their Season and Win The Title! 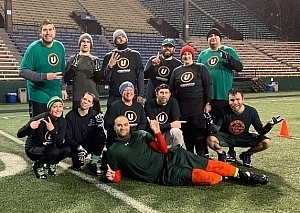 After finishing the regular season on a 1-3 skid, Space Force was able to turn things around at just the right time, pulling off three wins in a row against opponents they hadn't played all season to win the Softcore championship. After holding off a game Vicious and Delicious squad in the opening round, the Force dispatched with a Bills team that already had one upset against the two seed and a had a 2nd on their mind. 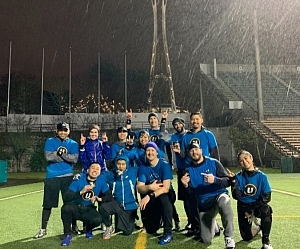 This brought up a very close back and forth affair between the champs and Q. Q was able to pick up the win by converting on their two point conversions when it counted. A several occasions they converted two pointers to keep the spread at 9 points, to keep it a two possession game and Q at arms length. On Tuesday the Thunder pulled off a pair of victories to show why they were the #1 seed and pick up another championship. After picking up their 2nd victory over the Monstars in a week one rematch, Thunder was looking for payback as Kirkland Signature had given them their only loss of the season. Thunder jumped out to a lead late in the 2nd half that they would never relinquish, going up two scores, which proved to be insurmountable. In a championship game against Brandon's Bald Eagles, Thunder avoided being the 3rd straight upset win for the Eagles. The rain proved to be a factor as the long passing game was held in check for both teams over the course of 40 minutes, but the Thunder was able to squeeze a couple through the raindrops to score 35 points.